I’m watching this mini-doc about the Tokyo Metro subway and they focus on customer service for a few minutes. They don’t explain why there’s a need to have so many staff at each station dedicated to customer service, aside from the plethora of passengers. I think one of the reasons is that the system is so vast and complex that so many people always have questions. Indeed I saw many Japanese confused or looking for where to go. I was at Ōmiya station in Saitama prefecture, north of Tokyo, and I wanted to ride the New Shuttle a short distance from Omiya to Tetsudō-Hakubutsukan to visit the Railway Museum, but I first wanted to get a “Suica” reloadable smart card so I didn’t have to keep buying single-ride tickets. Oddly I noticed at least five different kinds of ticket vending machines at different stations. They all will display in English, and a sign above each lists some of its functions. There are many overlapping machines. After I tried to buy one with one machine I asked a worker how I can buy a Suica card. He didn’t speak English and I didn’t speak Japanese but his colleague understood my unaccented pronunciation of Suica, and informed him what I was looking for. It turns out that the machines at the New Shuttle “side” (more on this later) of the Omiya station don’t sell new Suica cards. The man walked me over to the JR side of the station and introduced me and my problem to a Japan Railways East worker. This second man spoke English and guided me through buying a personalized Suica card; a card with my name printed on it. What was impressive was that the first man walked with me 570 feet away to the other side of the station, where he doesn’t work, instead of trying to point me in a direction. Even if he could verbally describe where I should go, that still wouldn’t solve my problem of obtaining a card because I would still probably have to ask someone else. This wasn’t unique in being “walked” to a destination. The next day in Chiba I bought a bento box “lunch set” (complete meal with veggies, meat, and rice) in the food hall of the Sogo department store, where there are dozens of independent shops selling fresh food. After I bought the food I wanted to know where there was a place to eat it. Again, I didn’t speak Japanese and the woman who sold me the food didn’t speak English. I mimed my problem, by looking around, pointing, and making an eating motion. She nodded and walked me over to a small eating area at the edge of the food hall. In Taiwan my host advised me that this would happen, and she also said to not hesitate asking someone for help. It happened one time in Taipei, but I don’t remember the circumstances. In a separate and similar occasion, however, a worker at the Taipei Discovery Center (which is similar to the city gallery in Singapore, Hong Kong, and many cities in China) approached me while I studied an exhibit. He talked to me about Taipei history, what I had seen so far during my visit (nothing, as this was my first stop on day one), what I planned to see (a lot), and then recommended more things for me to see (I checked out a couple things). I measured the 570 distance the New Shuttle worker walked with me to introduce me to a JR East worker who showed me how to buy a Suica card. Transit in Japan is privately operated and New Shuttle is one company (Saitama New Urban Transit Co., Ltd.) that operates one part of a station, and JR East operates the majority of the station. Tobu Railway also operates the station because it terminates a single commuter line here. Depending on how you look at it they are separate buildings but when you’re inside transferring from one to another there’s no distinction; the building connections are seamless. I’ve posted a few articles about my trip to four countries in Europe over the Christmas and New Year’s holidays, so this is purely a recap to link to them. Five common “best practices” that every city with a high-use transit system in Europe has that the transit agencies in Chicagoland should adopt. Day 1 in Switzerland on Mapzen’s Transitland blog – I discuss how amazingly interconnected Swiss public transport systems are, and how their single schedule data source makes it possible to get a route for a journey from Zürich to the top of a nearby mountain via four modes of public transport. 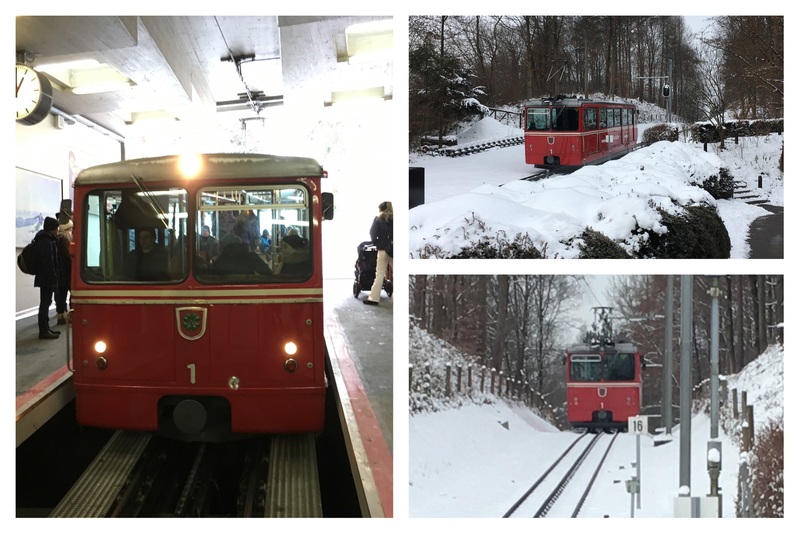 Day 2 in Switzerland where I spent a lot of time riding trams, buses, funiculars, and a cog railway to get around Zürich and visit a couple of museums. This is a list of day trips that you can take from Amsterdam. We might have different ideas of what constitutes the duration of the day. Once I get to a city I “travel quickly”: I walk fast, bike fast, and don’t linger too often at a point of interest, so I can see lots of places. This advice assumes you’ll arrive into the city center (where the train stations are) between 10 and 11 AM. Visit “vesting” Naarden (Naarden fort) to see a star-shaped fortress from the 1600s. You can take a bus or bike there from the train station. Hilversum is a richer city and has a lot of typically Dutch architecture, especially of buildings designed by Richard Dudok. Go here if you’re in the TV and radio industries. You’ll need a bike if you want to see even half of them. A lot of them are schools and apartment buildings. These two cities are a <15 minute train ride away from each other, with trains every 15 minutes. Haarlem is a short ride from Amsterdam and has a working windmill museum, near a panopticon-style prison. Perhaps stop here on your way to Zandvoort an Zee (beach resort). Get here early and leave late. Take the Intercity Direct to the city by 10 AM. That’s the high-speed train, and don’t forget to pay for or buy the “toeslag” (supplement) and you’ll get there about 30 minutes faster for a minor extra cost. Or, take the slower, scenic route there in the morning and the fast route back to your lodging in Amsterdam at night. Rotterdam is a very large city and has a lot to do. Rent a bike from Zwaan Bikes in Groothandelsgebouw on the next block west of the train station (my favorite in the world). Go on the 75-minute long harbor tour operated by Spido that starts on the northwest side of the Erasmusbrug (Erasmus bridge). In the evening, grab a bite to eat at Fenix Foods Factory and get a beer from Kaapse Brouwers in the same converted warehouse building. Delft is a very pretty city to walk around. It’s very touristic so you will see a lot of shops selling the local blue porcelain. I bought lavender goat cheese here, and it was delicious. Climb the steps to the top of the cathedral in the Grote Markt (main square). If you like architecture, head over to the university, TU Delft. You can walk there from city center in less than 20 minutes. Eat at Huszár which is a couple “blocks” south of the train station. The Hague – beach alert! If you don’t go to the beach, you could do Delft and The Hague in the same day, providing you aren’t spending time at museums and you have a bicycle to move a little quicker. Walk through the royal palace, Binnenhof. Take a tram or a bike to the beach at Scheveningen. Zandvoort an Zee – beach alert! This is a small beach resort town on the North Sea. Walk from the train station to the beach and keep walking until you find a beach lounge you like. Then grab a seat and order a drink (it’ll take a while for someone to come over, so find a menu yourself because it’s typical for a Dutch server to not bother bringing you one unless you ask for it). The Train Radar in Reisplanner Xtra (from NS, the Dutch intercity train operator) is a fun feature to show you trains nearby. The rest of the app is essential for efficient use of NS trains. I’ve used a bunch of apps that are necessary when you’re traveling within and between countries in the parts of Europe I’m staying in an visiting this year. The first app you should install is maps.me (iOS, Android, Amazon). It stores maps offline by downloading them from OpenStreetMap. Before leaving for the next city, download it on wifi! Each city takes up 25-60 MB on your phone, and it’s easy to delete a city’s map after you depart. This app is super fast, looks nice, has offline route planning, and can show any area in the world. Reisplanner Xtra, is essential because it has a journey planner for traveling within the country. It also shows real-time information, and even has a map of all the trains running in the country at that moment. It lists real-time OV-fiets bike availability. NS International, for looking up timetables for trains between the Netherlands and France, Germany, and Belgium. You can’t buy tickets in the app, but it will link you to a shopping cart on the NS International website. 9292.nl, journey planner app for all public transport in the Netherlands. It doesn’t have network maps, though, if you’re only interested in where the Rotterdam Metro goes. 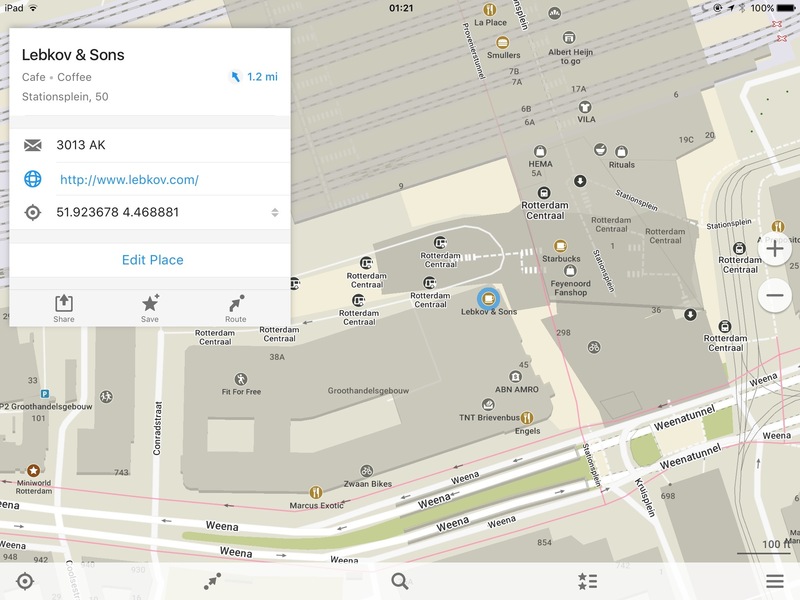 maps.me gets data from OpenStreetMap, the wiki-style map that regular people around the world edit (including myself). The map improves as more people add more information! DB Navigator, this has all public transport in Germany, including intercity trains. It even has intercity trains for so many other countries, regardless if that train has service in Germany. When you look up timetables for trains outside Germany, it will rarely be able to show you the price, but just seeing the schedule, and what trains are available, is important. You can buy tickets within the app, and use the app as a mobile ticket. Rome2rio, is remarkable because it will show you all ways to get between two cities, and it works worldwide. It incorporates timetables and maps from local transit systems, intercity coach buses, intercity trains, flights, and driving. It’s multimodal, too. It won’t book tickets, but it’s the only service I know of that focuses on showing the multitude of options – simultaneously, with prices! – for future travel planning. And it’s super fast – I think it’s getting results before you even push the “search” button. 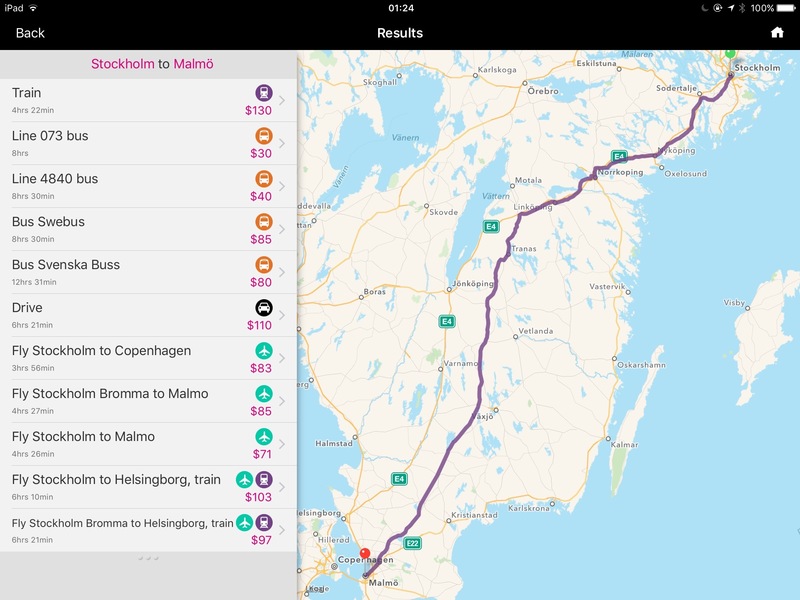 Rome2rio shows results for all modes (and combined modes) between two cities, here listing 11 options on trains, buses, cars, and plans between Stockholm and Mälmo, Sweden. Skyscanner, this flight-finding service has more intra-Europe airlines than services popular in the United States (like Hipmunk, Orbitz, and KAYAK). 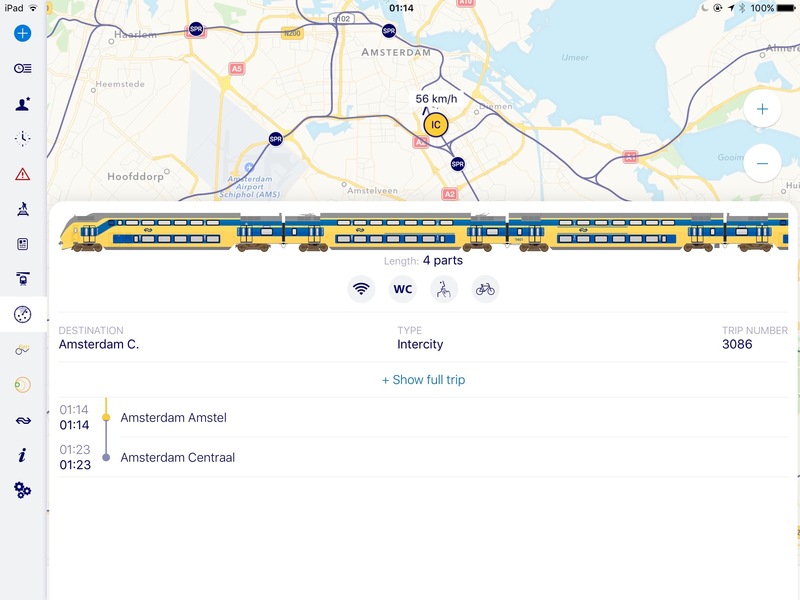 Captain Train is a continental train ticketing company with a nice app that will sell you tickets for service within and between many countries. Voyages-sncf, is useful if you’ll be taking fast or regular intercity trains in France, but I don’t believe it has mobile ticketing. However, you can buy tickets in the app or on the website and pick up the tickets at a vending machine at many train stations in France. This is where I bought a Thalys (high-speed train) ticket; it’s better than NS International and the Belgian equivalent from SNCB. United, this airline has implemented a superior entertainment system. I call it “Netflix in the sky”. To be clear, Netflix isn’t involved. It works like this: Install the United app on your device, and then connect to the airplane’s wifi network. There’s a server in the plane that has a lot of movies and TV shows, and these stream directly to your device. This is especially useful in United’s older 767 planes that don’t have seatback screens (IFE). What apps do you recommend and why? I’m posting frequent updates to my Tumblr. And my photos get automatically uploaded to Flickr. I also post photos to Instagram, and to Twitter. PK let me into the apartment and then we went to the Albert Heijn grocery store. PK soon departed to catch a train to another city for a birthday party. I took a three hour nap. I didn’t do anything else on Saturday. DS would return from his holiday on Monday evening. On Sunday I biked around the city. On Monday I met with Meredith, an expat living in Amsterdam. I also slept a bunch off and on. DS came home and we went out to dinner. We also went back to the grocery store and tried to figure out why neither my debit nor credit card would work. Albert Heijn, since I was there in September 2015, has changed their machines and policy and won’t accept my bank cards! On Tuesday I met with my friend Stefan. I found “Bataviakade” in Delfshaven. And slept at odd hours. I fell asleep on the couch at 20:00 and went to bed at around 00:00. “Bataviakade” means “Batavia quay”. I grew up in a city called Batavia, Illinois. The city was named after Batavia, New York. Batavia is the Latin word for the “Betuwe” part of the Netherlands. It’s now Thursday and I’m going to try and open a bank account here. This means I’ll get a debit card which will open so many doors; many places don’t accept international bank cards. It also means I can pay rent and for a bicycle without lower or no fees. After I get a bank account I can get a discount travel card to use on NS, the national intercity train operator. For €99 per month I can take unlimited trips on the intercity trains during off-peak hours and on weekends. I’ll be able to visit a lot more cities with this card, and I already have plans to use the train tomorrow, Saturday, and Sunday (that’s three round trips). The train fares add up! At least this weekend I’ll be traveling with DS; he has a travel card and companions can buy travel together with a 40% discount. I didn’t get to publish this before I left the house. I went to the bank and the kind worker said it wasn’t possible to open a bank account for someone who’s staying here for such a short time. She said there’s a monthly maintenance fee, and I said I would be okay paying that while I’m not in the Netherlands between visits. Anyway, my friend is going to help me get the discount travel card, which, to me, is the most important product I need. I also need to file my American tax return today. Me bicycling on the Hovenring in Eindhoven. It’s the world’s first, floating bicycle roundabout. It’s a gratuitous way to solve the problem the city had at this intersection outside the built up area. Despite its frivolity, it wasn’t as expensive as something that solves a similar problem in the United States. 6.3 million euros in 2012. The Navy Pier Flyover in Chicago is over $60 million in 2014. In my last trip to Europe, which concluded three weeks ago, I hadn’t yet scheduled where I would stay on Monday, Tuesday, and Wednesday nights on my final full week (I came home the following Tuesday). On that Monday I was in Barcelona but my mother was going back home and I had to move on. On Thursday I was going to be in Bonn. “Where should I go?” I debated. I considered Morocco (that was a complicated journey and I didn’t want to go alone), and Salzburg or Austria. Then, after talking to a couple before and during my trip I decided I would stay in Lyon, France. Once I was in Seville, though, right before heading to Barcelona, I started looking at possible journeys from Barcelona to Lyon. They weren’t looking good. They were cheap, but the timing was bad – flights weren’t frequent enough, departed and arrived at odd times, and the train journeys were long. But “timing” turned out to be just an excuse to avoid having to go to France and skip going to the Netherlands. I really wanted to go to the Netherlands. It wasn’t possible for me to skip visiting some Dutch friends and the greatest country for transportation and utility cycling. I still had more things to see there! My favorite train station in Europe: Rotterdam Centraal. My friend Daniel in Rotterdam was available to host me for a couple nights. There was no contest anymore: I booked a flight on Vueling from Barcelona to Rotterdam, just 90 minutes away. And he was even going to pick me up at the tiny airport so we could take the bus to the central train station and get me an OV-fiets bicycle (it’s the national bike-sharing system that requires a Dutch bank account to rent). On this trip to the Netherlands, though, I only added one new Dutch city: Eindhoven, where I had to see the Hovenring. I paid an arm and a leg to get there – thanks, expensive intercity Dutch train travel prices! The list excludes cities I only transited or biked through. I’ve transited through Venlo half a dozen times by now. It’s on the German border. It’s a tiny station, tiny town, but has a lot of intercity traffic. I’ve biked through Pijnacker twice, now: once while biking from Rotterdam to Delft in 2014, and the second time, in 2015, I took the metro there and biked the rest of the way to Delft (this time to see the new train station). I’ve also biked to the Hook of Holland in 2014; not the city, but the port, canal, and to see the Maeslantkering, a flood barrier that’s part of Delta Works. What’s up from Europe: how much is car-free when cycling on a Dutch intercity path? I posted this photo of Daniel riding with me from Rotterdam to Delft and Justin Haugens asked, “Was this a bike path the whole way?” and added, “[This] would be similar to my work commute.” He rides on the Chicago Lakefront Trail from Rogers Park to South Loop, but must ride off-path from Morse to Ardmore and about Monroe to Roosevelt. Daniel lives in Rotterdam and works in Delft. The Dutch Cyclists’ Union’s (Fietsersbond) Routeplanner says the shortest path is 11.47 kilometers, or 7.12 miles. We took the short route on a Saturday, but chose the scenic route on Sunday (the day I took this photo) so Daniel could show me the airport, underground high-speed rail tracks, and various geographic features along the way. It was a dedicated bike path for probably 90% of the way. The thing about Dutch intercity cycle routes is that they separate cycle paths from car paths when the two modes can’t safely share. They can’t safely share when there’s a desire for moving cars quickly or moving big autos (like trucks and buses). So, there were some points on this journey when the cycle-only path merged with a local road or a service drive [the case in that photo, actually, which you can see better here], but even then the cyclist always has priority and rarely are the junctions configured/signed so that the cyclist has to stop (not requiring the cyclist to stop is a way to make cycling a convenient mode). In the Netherlands connectivity of bicycle-priority ways is as important as the infrastructure used. When I first visited the Netherlands, in 2010, I arrived in Amsterdam from Bremen, Germany, and rented a bike the next day. I was personally shocked that morning when I rode upon streets with conventional bike lanes (these would be the ones in door zones in the United States) on some streets. Why was I shocked? I came to the city under the impression that all bicycle infrastructure were cycle tracks, meaning a bike path between the roadway and the sidewalk, on a level slightly above the roadway and below the sidewalk. Since then I’ve learned a lot more about why the Dutch cycle so much and how the bicycle is sometimes used more often than public transit and automobiles. On our journey from Rotterdam to Delft we must have ridden on every kind of bicycle path the Dutch have designed. These photos sample what we encountered. The route followed an arterial road for the first portion, but we turned off after only about a mile. An RET metro train follows the cycle path for a portion of the route we took. This was my favorite part of the journey to Delft: we came across a shepherd, her two sheep dogs, and her flock of sheep grazing on the bank between the cycle path and the creek. I’m no longer in Europe but I’ve kept the title prefix, “What’s up from Europe”. Read the other posts in this series. I’m staying in Groningen for three nights, the northernmost big city in the Netherlands, with about 190,000 inhabitants. About 20 meters from my bedroom window is a passenger train line on which diesel multiple units (DMU) running frequently. I hear the train come very often and I snapped a few photos, of course. As I saw the train frequently run, with 1-2 diesel cars, I thought that Metra – Chicago’s hub-and-spoke commuter rail system – needs to implement a nimbler operation with more runs to make it more convenient to use transit. I tweeted that thought. The train is a “Stoptrein” because it makes all stops. This is one of four passenger train classes: “Intercity” trains make few and distant stops, the “Sneltrein” offers express service to a small number of local stops, the “Sprinter” class makes a medium number of local stops. I can see from the schedule on 9292.nl that the train, after 21:00, runs every about every 26 minutes in each direction. At other times of the day there may be two trains four minutes apart or 15 or 24 minutes apart. Stadler in Switzerland built these “GTW” DMUs which accelerate faster which could improve the timetable. I suggested that Metra run this rolling stock on the UP-West and UP-North lines because of their existing ridership and closely spaced stations. Also, UP-North doesn’t have freight trains so it should be easy to get a waiver from the Federal Railroad Administration to use lighter weight European trains. UP-West is another “streetcar suburb” line having trains stop frequently during rush hour in city centers; stations are 4-10 minutes away from each other so the train can’t reach high speeds quickly between them. I visited New York City two weekends ago for a Streetsblog writers conference. I was there for three nights and four days. To get around I put a bunch of cash on a Metrocard to use the subway and JFK Airtrain and I bought a 7-day pass for the Citibike bike-share system. Citibike and Divvy in Chicago use nearly identical equipment from the same manufacturer, and Alta Bicycle Sharing operates both systems. Citibike sells the 7-day pass for $25, a relative steal for personal transportation costs in New York City – probably any city. Divvy only offers 24-hour and annual passes. Citibike stations have maps of a better design that matches the walking wayfinding stanchions that New York City’s Department of Transportation has installed. The stations integrate the ad+map board onto the kiosk while Divvy has separated them. I don’t see an operational advantage to either design, but there does seem to be less material used in Citibike’s integrated design which uses one fewer solar panel. I’ve never used Divvy’s touch-screen kiosk to obtain a single ride code as part of using a day pass so I can’t compare it to interacting with the Citibike kiosk to obtain the ten or so ride codes I needed on my trip. This was the most infuriating part of the experience, which annual members don’t experience because they have a key: the kiosk is very slow in responding to a tap and sometimes the docking bay wouldn’t accept my brand new ride code. You can’t get a replacement ride code for two minutes, preventing quick dock surfing. The bicycles seem exactly the same: too small of a gear ratio which means a slow top speed and an easy-to-reach “over pedaling” threshold. This may be more important for New York City to have because you must climb 140 feet up the bridges to cross between Manhattan and Brooklyn or Queens while Chicago has no significant slopes. I eventually stopped using Citibike in favor of the subway and walking. I like riding trains almost as much as I like riding a bicycle and cycling in downtown Manhattan is difficult if you’re unsure of a good route to get to your destination. I prefer to not use an app for directions because of how frequently the turns appear meaning I have to inspect the app just as often to ensure I made the right one. I’d like to see my Divvy key work in other cities where Alta operates bike-sharing. Just charge my bank card on file, applying the lowest-cost pass and letting me bypass the user agreements before purchasing a pass in another city.